Assessment is an ongoing process. 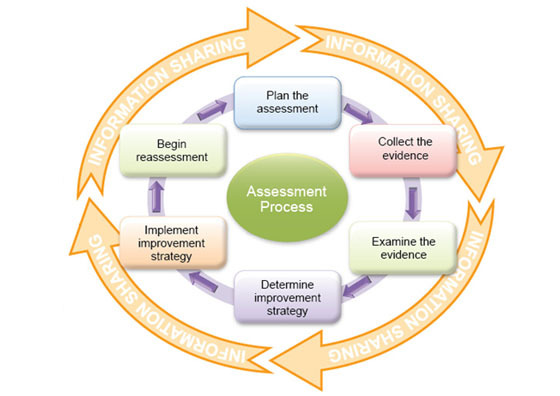 The cycle of assessment includes planning the assessment, collecting the evidence, examining the evidence, determining an improvement strategy, implementing the strategy, and beginning reassessment to determine if the improvement strategy has helped increase student learning. Macomb Community College faculty assess student attainment of course and program outcomes and report findings on course and program assessment action plans. These assessment action plans are housed in the Assessment Resource Center. In addition to general demographic information, the action plans include descriptions of the evidence collected, the assessment tool used, an overview of assessment findings, the proposed improvement strategy, and the information dissemination plan. Five Common Degree Outcome statements identify the skills, knowledge and abilities associate degree recipients of Macomb Community College are expected to achieve, as appropriate to the student's program. The five CDOs align with the college’s mission and include knowledge and skills that pertain to thinking competently, using mathematical knowledge, communicating competently, being sensitive to a global and diverse society, and using necessary technological skills. The pilot project that was introduced in 2016-2017 to support the development of a framework to assess Common Degree Outcomes will continue in 2017-2018. 2016 - 2017: A team, comprised of faculty, Academic Development staff and Institutional Research prepared for and planned the appropriate assessment strategy for CDO 2: The graduate can demonstrate how to think competently. The team identified indirect and direct assessment methods, ensured validity and reliability in the assessment methods, gathered and analyzed evidence of student learning and disseminated the assessment results to all appropriate stakeholders. For more information regarding the 2016-2017 Common Degree Outcome assessment pilot project, click here. 2017 - 2018: For the second round of assessment the same Common Degree Outcomes assessment team continued to develop and enhance the framework used to assess CDO 3: The graduate can demonstrate how to employ mathematical knowledge. The team focused on increasing rater reliability and validity by providing additional training on norming in addition to having assessors rate all evidence twice. For more information regarding the 2017-2018 Common Degree Outcome assessment pilot project, click here. In addition to the direct assessment initiative, Common Degree Outcomes have been indirectly assessed using the Community College Survey of Student Engagement (CCSSE) data. CCSSE collects data on student engagement and five benchmarks of effective education: active and collaborative learning, student effort, academic challenge, student faculty interaction, and support for learners. The CCSSE data is collected every 3 years, with the first collection occurring in the Winter 2007 semester. The Program Assessment Team aligned applicable items on the CCSSE to Macomb's Common Degree Outcomes (CDOs) for an indirect assessment of CDOs. The Office of Institutional Research created a report that maps students' perception of involvement in activities identified in CCSSE to the five Common Degree Outcomes. The report indicated that students perceived they are involved in the activities that are identified in CCSSE and are mapped to Common Degree Outcomes. The report also indicated that this involvement has increased over time. Another indirect measure of Common Degree Outcomes is the Graduation Report. Official course syllabi indicate which CDOs students are exposed to in each course. Using this information, a CDO graduation report was created to indicate graduating students’ level of exposure to each CDO. This indirect assessment is used to determine the extent to which graduating students have taken courses that align to each of the CDOs. The program assessment plans continue to build on the work (detailed below) that was completed in 2014 by the Program Assessment Team. 2014 - 2015: All program outcomes and related assessment activities were housed centrally for the first time in the Assessment Resource Center. 2016 - 2017: Program faculty reviewed their own applicable program outcomes that were housed centrally in the Assessment Resource Center. Any edits to the program outcomes were submitted to the Curriculum Committee for approval. 2017 - 2018: All program outcomes were included in the 2017-2018 electronic academic catalog. In addition to the review and editing of program outcomes, ongoing program assessment will occur. Almost half of the programs have assessed in the last three years with the expectation that all program will be assessed in the next two years. The Office of Academic Development collected information across disciplines on program level outcomes and assessment activities. The information is housed in the Assessment Resource Center. There are approximately 70 programs that lead to degrees as well as many transfer plans, certificate options, and areas of study at Macomb. Each of our career area programs has advisory boards and many have outside accreditation bodies in addition to the North Central Association’s Higher Learning Commission accreditation. The lead faculty member in the career area program ensures that the program outcomes and content meet the accreditation body's standards and align to national/state examinations and certifications. A Program Assessment Team, comprised of cross-disciplinary faculty members and administrators from Institutional Research and the Center for Teaching and Learning, developed and disseminated processes, strategies, and resources to the wider college community on program assessment. The Program Assessment Team developed workshops, and gave presentations to faculty at Faculty Development Day and Institutional Development Day. The Program Assessment Team also presented at the 2013 TRENDS conference. Developed rubrics or assessment tools for assessing classes that map back to program outcomes and CDO's. In addition to the ongoing course assessment activities (housed centrally in the Assessment Resource Center) for the over 1,000 courses offered at Macomb Community College, the Top 30 course assessment initiative began in 2010. In 2010 Macomb Community College identified the Top30 courses - courses that either have the most sections offered and highest student enrollment and/or are most often taken by students who earn a degree from the college. A concerted effort was made to assess the outcomes in these courses. By 2015 all Top 30 courses had gone through the assessment cycle and will continue to assess on a regular schedule.